"Star Trek's series typically present the crème de la crème of the Federation, disciplined rocket scientists aboard state of the art military vessels. Star Wars generally has us following back world civilians, guerrillas, politicians, warrior monks and front line troopers. It's more like taking a story set on a 1960's, or even a 1980's nuclear submarine, where the environment is cutting edge, and advanced technology and weaponry is commonly referred to. Then we compare it to a story following a modern day soldier in his barracks, where nobody talks about advanced technology, we never see any nuclear weapons in use, and it would be easy to miss the implications of the smart phone in his pocket, or the satellite positioning and other electronics in his "crude" gasoline powered vehicle. Without previous knowledge of these environments, an observer of such "fictional" environments could easily conclude that the former scenario represented a far more technologically advanced society and military." This is an interesting point, DS, except we have also seen TCW, which is basically like NCIS or something inasmuch as having a well-funded more-or-less military group of jetsetting specialists with all manner of fancy toys at their disposal, with the bonus that they are also leaders of a war effort. In that sense, by your argument, Star Wars has it better than Trek, some would argue. Anyway, he got 25g for the loop into the asteroid monster by the Falcon. Pretty close to my Falcon figures. Actually, on further review, there is more camera motion than I prefer here, plus a tiny FX flub. First, the Falcon appears from top of frame and if you watch her against the stars she traverses her own length in about seven frames at 25fps for a speed (at 35m length) of about 125m/s. Then the camera really whips about ... note the extra stars that become visible from over the horizon ... at which point she seems to traverse in 4ish frames against the asteroid horizon, et cetera. Then we hit the boo-boo (after the end of your .gif) where the animators used the 3- to 4-frame rate to draw in the shadows but the Falcon itself takes 7 frames to disappear beyond the rim of the hole. Point being, I think her downward velocity does not actually exceed 125m/s or thereabouts. And that is just the end of the loop. That comes out to 115 m/s^2, or about 11.75g, by your equation. The calculation he used assumed a constant velocity in the loop of 267m/s, so the difference is significant. "As much as I enjoy this discussion, it seems clear to me that the Federation wins this fight. Why? 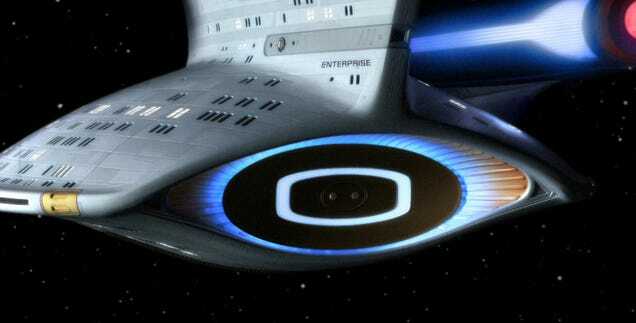 Pictured is the navigational deflector, or more commonly "main deflector dish" of the Enterprise NCC-1701-D. It's primary purpose is to prevent particles from damaging the starship while at warp speeds, where even a tiny impact could impart catastrophic damage to the vessel. However, in practice, the main deflector can be modified in a number of ways in order to produce whatever effect the script writers happen to need at the time. Need to beam your crew of a planet, but there's an anti-neutrino storm preventing transporter activity? Use the deflector dish to beam a stream of neutrinos to counteract the field. In other words, the f***ing thing is magic, and the Federation has them. I've seen the real power in the universe, and it ain't the Death Star, and it sure ain't the Force. It's this thing. "